James Holt knows how critical insulin is to diabetics. "It's oxygen — How we need oxygen to breathe, they need insulin to live. It's the same." Holt's son, Alec Smith, died in 2017 after scaling back on the medication he struggled to afford. "It's time we do something about it. Enough is enough," Holt said. "We lost our 26-year-old son way too early." 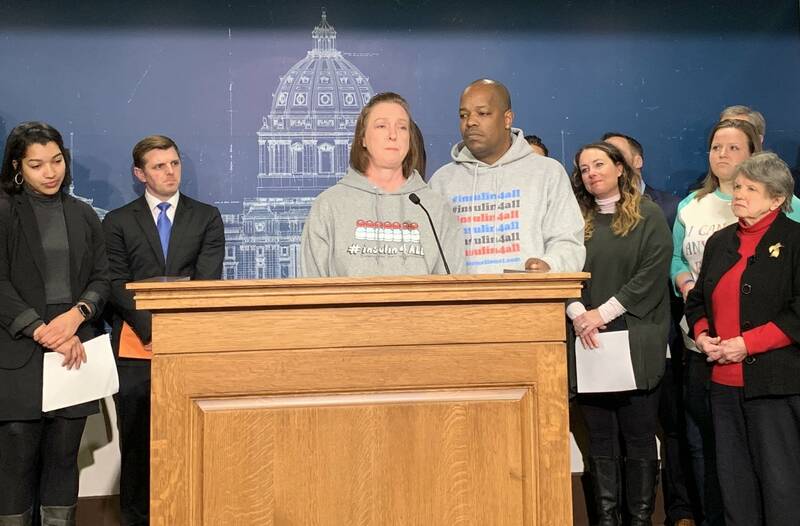 Holt and his wife, Nicole Smith-Holt, came to the Capitol Tuesday wearing sweatshirts with the social-media hashtag "#insulin4all" and urging lawmakers to step in so other diabetics don't have to ration their insulin. Alec's name could one day appear atop a new law establishing emergency access to insulin for people who lack the ability to pay for it. State Rep. Michael Howard, DFL-Richfield, keeps a framed photo of Alec on his desk in the House chamber. Howard sees the heartbreaking story as a call to protect the estimated 320,000 Minnesotans with Type 1 or Type 2 diabetes. "Never again should someone lose their life simply because they cannot afford the insulin they need to survive," Howard said. The first-term legislator is sponsoring the bill that would help diabetics get prescriptions filled on a temporary basis if they attest to financial need. Pharmacies would be reimbursed through a fee on insulin manufacturers. The size of the fee hasn't been determined. It's one of four approaches on the table to maintain access or control insulin costs for diabetics through new state regulations. Others seek to curb prices by demanding more transparency from manufacturers, distributors and companies that administer prescription programs for insurers. Another would bar insurers from removing brands of insulin, equipment or supplies from their plans during a subscriber's 12-month enrollment period. Sen. Scott Jensen, R-Chaska, is a family doctor of 35 years. He's promoting the part of the package that deals with transparency in drug pricing. He said insulin, of which a weekly supply can cost hundreds of dollars, is a good place to start. "The spotlight on insulin will serve to simply magnify that we have to put a spotlight on pharmacy in general," he said. Jensen said his Republican Senate colleagues are open to the discussion, but some have expressed concern about going too far with regulations. Senate Health and Human Services Committee Chair Michelle Benson said lawmakers have to be careful about crafting laws around one medication. She said if insulin is an outlier, it could get special attention. But Benson, R-Ham Lake, is leery about the discussion of a possible fee. "I'll proceed with caution with adding fees because adding fees doesn't do a very good job of lowering cost," she said. "But if we need to support people in crisis, maybe we can find something there." Sen. Matt Little, DFL-Lakeville, is pushing several of the bills. He said a fee shouldn't be viewed as the backbreaker. "If you can't afford $1,500 insulin, it doesn't matter," said Little. "We need a way to get people emergency access. So, if insulin manufacturers are all the sudden now concerned about the price of insulin, please come to my office." Alexis Stanley does have concerns. She's a college student and a Type 1 diabetic. Stanley is 19 now and on her mother's insurance. But she already worries about what could happen when that coverage goes away. "This disease is real," she said. "None of us asked for it. So why is our life their profit?"